Figuring out how to get to Apo Island in the Philippines doesn't require vigorous effort, but you will need to be a little flexible. Boats come and go on a loose schedule, and as usual in the islands, weather can change everything. Apo Island is a part of the Visayas — a division of major islands in the heart of the Philippines — and is usually accessed via Negros, the fourth largest island in the Philippines. Most travelers to Apo Island begin in Dumaguete — the capital and seaport for Negros Oriental. Get to Dumaguete by one of the many ferry connections from Cebu, Siquijor (the "island of black magic"), or Tagbilaran on Bohol Island. Alternatively, you can fly into the tiny airport in Dumaguete (airport code: DGT) from Cebu City or Manila. Once in Dumaguete, you'll inevitably be approached by private drivers for the 45-minute ride south to Malatapay, the jump-off point for reaching Apo Island. You can either negotiate for the best fare or save money by taking public transportation south — an option that is far slower but much cheaper. For public transportation, begin by taking a motorcycle trike to the bus terminal in Dumaguete (30 pesos). Jump on any southbound bus or jeepney (going toward Zamboanguita). Tell the driver that you want to go to Apo Island. You'll pay the fare on the bus (around 60 pesos), not at a ticket window. You will most likely get dropped off literally on the side of the road in Malatapay next to a large sign that reads "Apo Island." Follow the arrow and walk 15 minutes through the market area to the boat jetty. Malatapay is quiet and pleasant enough. You'll find a small black-sand beach and some beach cafes where you can use facilities to kill time in comfort while waiting for your boat. A large Wednesday market is held on the path leading to the boats. Don't get too distracted in the sprawling market and miss a chance for a boat! Apo Island is approximately an hour by motorized outrigger canoe from the Negros mainland. You have two choices for crossing over to Apo Island: Arrange a private charter boat — the most expensive option — or wait for a public boat heading over. Someone should be on hand in the wooden to advise you of available options, or walk into the Beach Cafe and ask there. Chartering a private boat (between 2,000-3,000 pesos depending on the size) means that you can leave right away. If you choose to take the "public boat" (approx 300 pesos), you may have to wait for several hours. Boats do not follow a regular schedule and leave once enough passengers are ready — which typically isn't a problem if the weather is good. Alternatives include either teaming up with other travelers to share the cost of chartering a private boat or hitching a ride with one of the regular supply boats from the resorts on Apo Island. Prices are fixed, so no need to negotiate. Note: Boats are clearly labeled with the maximum number of passengers allowed; this limit is usually strictly enforced. Plan on a crew of at least three for each boat. Regardless of whether you choose a chartered boat or a public boat, you will definitely get wet! Sea swells can get rough between Apo Island and Negros. Waterproof all your belongings; store cameras and other electronics that can't handle getting splashed. Luggage is stored inside the boat hold, which may or may not be entirely watertight. If boats are full or you do become stuck at the jump-off point for Apo Island, don't despair too much. Although maybe not as idyllic as staying on the island, there are a handful of accommodation options in the area. Plus, you'll have electricity and a few different more food options. After arriving on Apo Island, you'll have to wade out in knee-deep water to get on and off the canoes. Plan to get wet up to the waist depending on conditions. 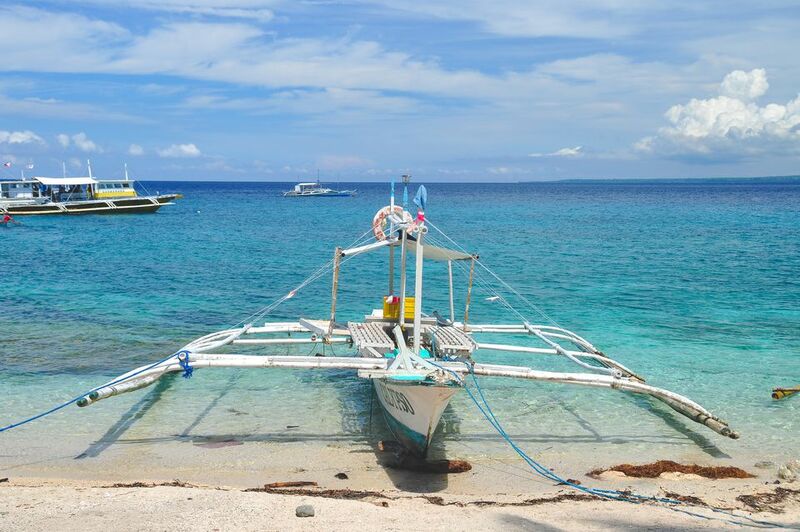 Your boat will pull up to the beach front somewhere on Apo Island; you can easily walk to your resort. Begin walking to the left when you arrive on the beach to find most accommodation options. Siquijor Island: Check with the Coral Cay Resort on Siquijor Island (in San Juan near the south part of the island) for boats. Negros Oriental: The isolated, friendly Kookoo's Nest Resort in Tambobo Bay on the southern end of Negros also runs dive boats to Apo Island (minimum of two divers). If you know exactly how long you will be staying, arrange your boat as a round-trip fare. Paying for a round-trip fare means that you won't be able to stay longer than planned (easy to do on Apo Island) and you will have to find the correct boat back to the mainland. For more flexibility, walk into Liberty Lodge or Mario's Homestay and let them know that you wish to leave the following day. There may be a good chance you can join one of their mainland-bound boats for around 300 pesos. Once back on the Negros mainland, simply walk back to the main road and jump inside of a northbound jeepney or flag a bus heading north toward Dumaguete.